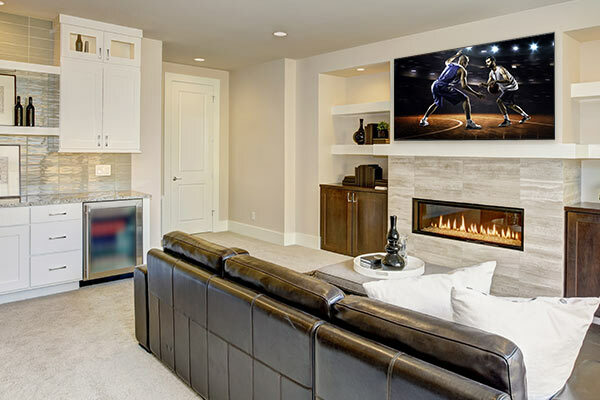 When it comes to movie night or game day at your home look to Electronics World to design a system that blends with your décor yet provides the thrills, chills, and drama of Hollywood as well as all the hits and dunks of your favorite sporting event. A properly designed media room system takes into consideration the room shape and size, the amount of ambient room light, seating arrangement, your auditory and vision needs as well as the aesthetics. Electronics World staff designers and technicians are experts at putting it all together to be easy to operate, invisible and maintenance free. Whether the cornerstone of your media room experience is a large video display or merely accessing your music and movie collection easily from your smart device, Electronics World will help you achieve the media room of your dreams. For the ultimate media room experience consider a large screen video system from Sony, enjoy up to 300" of video, access to your cable or satellite service, disc player and hundreds of movie streaming applications, in stunning 4k resolution with high dynamic range with Dolby Atmos digital surround sound.